High winds in the forecast have forced officials in Windsor-Essex and Chatham-Kent to issue warnings about flooding. The municipality of Chatham-Kent has already closed Rose Beach Line over South Marsh Creek due to erosion from Lake Erie along the edge of the road. Officials say in the interest of public safety, Rose Beach Line will no longer be available as a through route between Morpeth and Rondeau. The alternative route is Talbot Trail and Kent Bridge Road. Officials from the Lower Thames Valley Conservation Authority and the Essex Region Conservation Authority are concerned about strong winds in the forecast. Forecasted winds for Tuesday and Wednesday are in the range of 45 km/hr to 50 km/hr with strong gusts up to 90 km/hr that have the potential to impact the entire Lake Erie Shoreline. Waves can be expected to reach 1.5 meters in height. 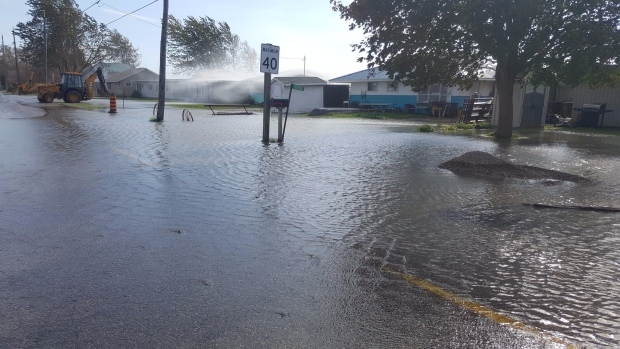 The LTVCA says in flood prone areas such as Erie Shore Drive, and some specific areas around Wheatley, there is a risk of flooding caused by waves crashing against the shoreline and spraying onto land. Officials are also concerned about damage to shoreline structures. Residents are encouraged to take extra caution and avoid shoreline areas. Waves overtopping breakwalls can be extremely dangerous. Children, pets, and livestock should be kept away from flowing water, standing water as well as breakwall and shoreline areas.